This month, people in Russia, India, and now China have been uploading photos of themselves “falling” out of their luxury vehicles, surrounded by the carefully arranged detritus of their wealth, ranging from Gucci bags and jewelry to headphones and Supreme clothes. What’s become known as the “Falling Stars” challenge is basically the Rich Kids of Instagram turning their fortunate statuses into a meme. It all seems to have started in August when a Russian Instagram user posted an image of herself falling out of a private jet. The trend has since arrived to Chinese social media, where it’s dubbed a more self-explanatory “wealth-flaunting challenge” (as spotted by Abacus). Since the meme is essentially materialistic, it was ripe for co-opting by tech companies, pet food companies, and the government alike, all for self-promotion and marketing. All types of brands are using it to show off their wares. 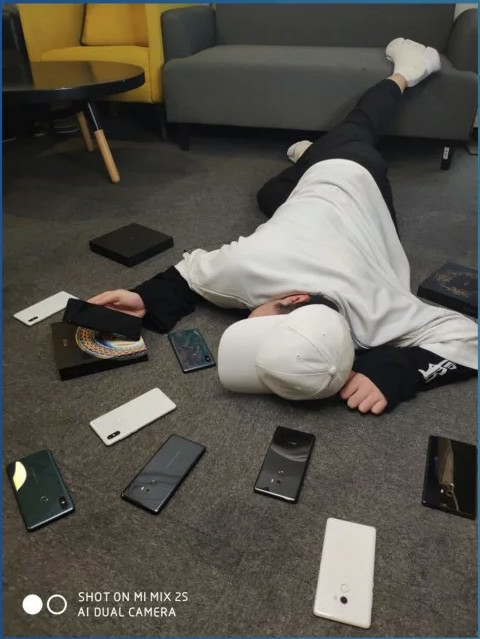 Xiaomi, for example, posted an image taken on the Mi Mix 2S of an employee clutching what appears to be the company’s unreleased flagship, the Mi Mix 3, while surrounded by other noteworthy phones. Not to be outdone, DJI made an Instagram video set to Dr. Dre and Snoop Dogg’s “The Next Episode,” where a guy strolls over with a luggage full of drones, trips and falls. This is my personal favorite because there’s actually a narrative to the whole thing. The Chinese government also got in on the action in classic “How do you do, fellow kids?” fashion, with security guards, police, and bureaucrats all participating in their own versions. 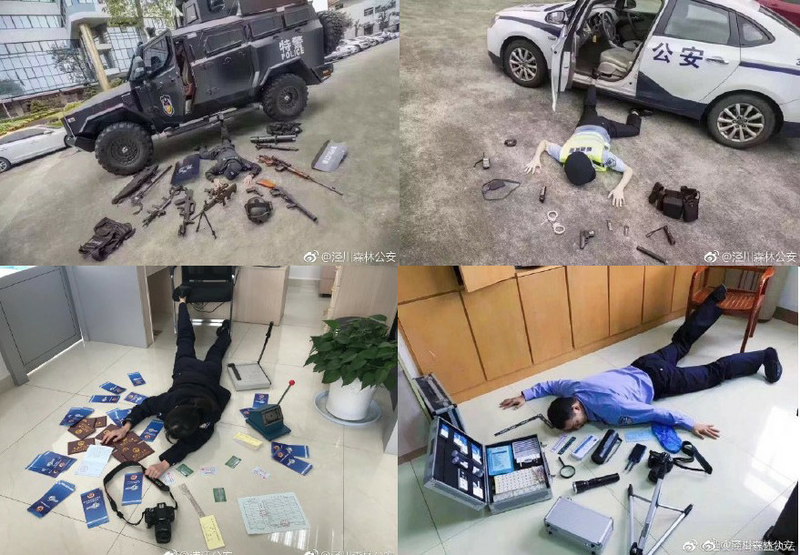 Some of the police that got involved from the Luanchuan Forest Public Security Bureau in northern China posed next to an alarming number of guns. Various Chinese government officials pose with their guns, brochures, and equipment. Yet, as is the case with many viral memes, not everything turned out to be fun and games. Two women in China who posed as falling out of their car with Gucci bags and makeup were later found by police and fined for disturbing traffic. A couple in Shanghai was fined for parking their luxury car the wrong direction while in the midst of taking one for the ‘gram. In both instances though, the fines were no more than 150 RMB or $21.65, a mere slap on the wrist for anyone wealthy enough to participate.